Philipp Foltz (1805–1877), Emperor Friedrich Barbarossa and Duke Henry the Lion in Chiavenna (1176) (date not known), media and dimensions not known, Maximilianeum, Munich, Germany. Wikimedia Commons. The only Barbarossa that most of us know is Operation Barbarossa, the Axis invasion of what was then the USSR (now the Russian Federation), which started on 22 June 1941, during the Second World War. What possible connection could there be between a military operation which resulted in over six million casualties, and a red beard (the meaning of Barbarossa)? As far as I can see, the Barbarossa in question was Frederick I, King of Germany from 1152, and Holy Roman Emperor from 1155, until his death in 1190. As he was also King of Burgundy and King of Italy, he was one of the most powerful rulers in Europe since the collapse of the Roman Empire. And he had a red beard. Barbarossa still has the reputation of being one of Europe’s least despotic rulers too, which is surprising for that feudal period. Among his many achievements was the reintroduction of Roman rule of law across much of Europe, which gave its peoples rights which they could defend. Although this Corpus Juris Civilis was not exactly liberal, and a far cry from modern legal rights, it was a huge step forward for much of the population of central Europe at the time. Barbarossa has also featured in many paintings and other artworks, from his own lifetime until the late nineteenth century. It is those that I will look at here. Bernardo Cane (fl 1580s), Friedrich Barbarossa (before 1583), oil, dimensions not known, Archivio Notarile distrettuale, Pavia, Italy. Wikimedia Commons. Bernardo Cane’s full-length portrait of Friedrich Barbarossa was probably painted between 1580-83, and portrays him as a combination of king and saint, with a pious appearance which almost merits a halo. His hair – and the all-important beard – is quite distinctly red. Barbarossa was born in 1122, the nephew of King Conrad III of Germany, and as a young man became the Duke of Swabia, in the south of Germany. He accompanied his uncle on the Second Crusade, which was a bit of a disaster overall, but acquitted himself well, and succeeded his uncle as the King of Germany. This was a mixed blessing: at the time, his kingdom was a loose patchwork of more than 1600 individual states, some of which were large and powerful, such as Bavaria and Saxony, each had its own prince, and many were openly hostile towards Frederick. In March 1153, Barbarossa made peace with Pope Eugene III in the first Treaty of Konstanz, promising to make no peace with King Roger II of Sicily, an enemy of the church, and to help the papacy regain control of Rome. To those ends, Frederick undertook six campaigns in Italy, by then against King William I of Sicily. On 17 June 1155, Barbarossa reached Rome, where he received the Pope. There was an unfortunate muddle over protocol, but the following day Frederick was crowned Holy Roman Emperor in the city’s Basilica of Saint Peter. When he returned to Germany, Barbarossa restored peace there by transferring the duchy of Bavaria to his younger cousin Henry the Lion, and rejigging other duchies to accommodate those who might otherwise have become enemies. He married Beatrice of Burgundy in 1156, effectively adding her lands to his territory. This enabled him to return to Italy in 1158 to establish his authority there. 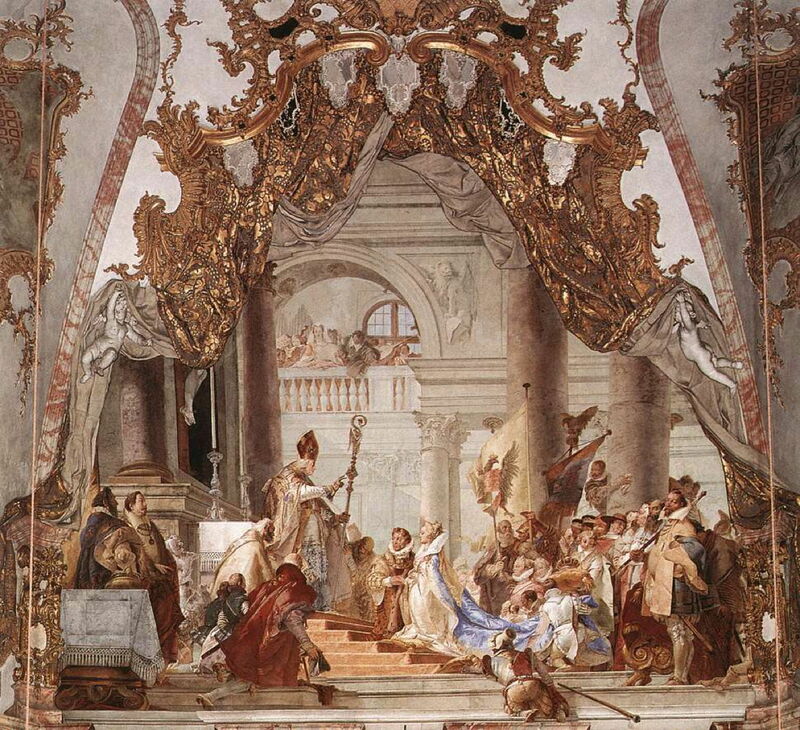 Giovanni Battista Tiepolo (1696–1770), The Marriage of the Emperor Frederick I Barbarossa to Beatrice of Burgundy (1751), fresco, 400 x 500 cm, Würzburger Residenz, Würzburg, Germany. Wikimedia Commons. Tiepolo seems to have been a fan of Barbarossa or, more likely, his patrons were. Among his several paintings of the emperor is The Marriage of the Emperor Frederick I Barbarossa to Beatrice of Burgundy, an ornate fresco he made in 1751. Philipp Foltz’s undated painting of Emperor Friedrich Barbarossa and Duke Henry the Lion in Chiavenna (1176) is the first work that I have seen which relies on colour-coded beards. The emperor wears the crown and gold mantle, and has the red beard. He is in trouble in Italy, and seeking Henry the Lion’s help to get him out without defeat. Henry, with his black beard, stands unmoved in front of Frederick – a refusal which Barbarossa never forgave. In 1175 and 1176, in the absence of Henry’s support, Barbarossa was defeated at Alessandria and in the Battle of Legnano, where he was wounded and nearly killed. The following year, he was reconciled with Pope Alexander III, and had to humble himself before the Pope in Venice. He also established permanent peace with the Lombards in a second Treaty of Konstanz, in 1183. Achieving peace in Italy took longer, requiring the marriage of his son Henry to Constance of Sicily in 1186. 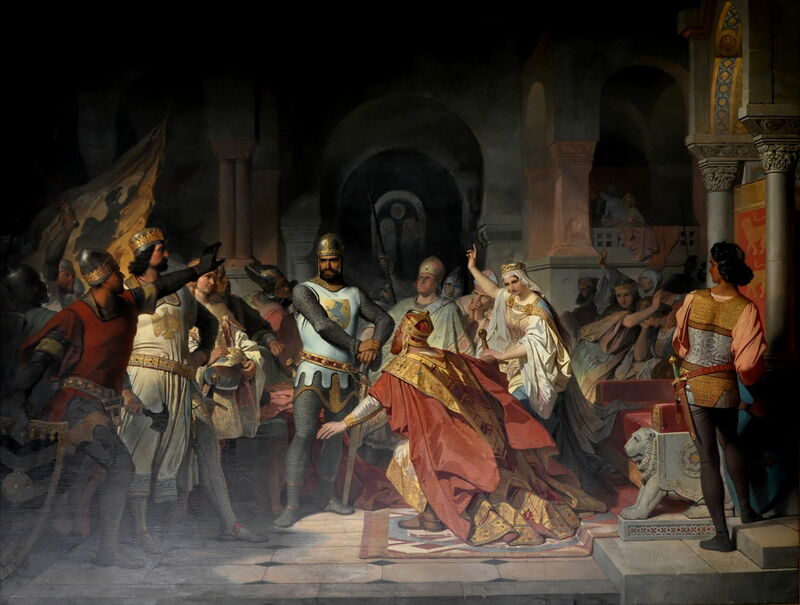 Peter Janssen (1844–1908), Submission of Henry the Lion before Emperor Frederick I Barbarossa in the Peterskirche, Erfurt, in 1181 (1882), further details not known Image by Klaus G. Beyer, Weimar, via Wikimedia Commons. 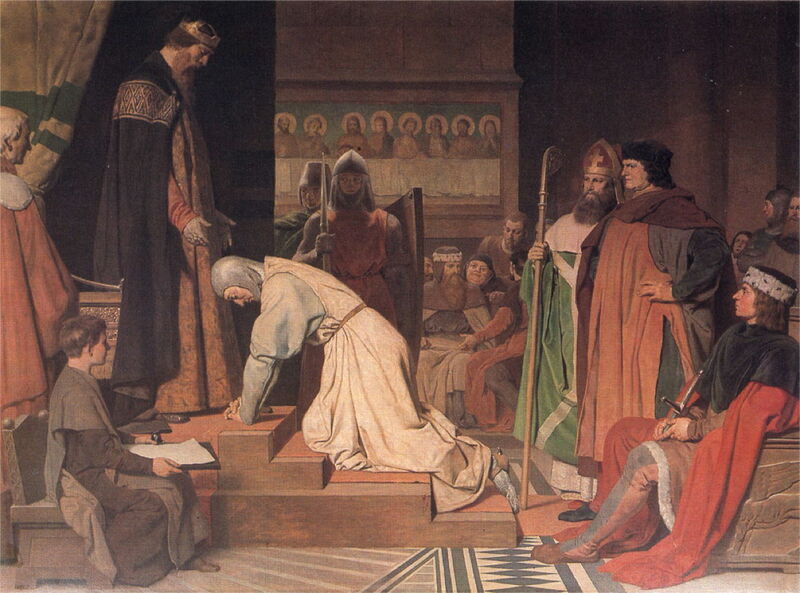 Peter Janssen’s 1882 painting of the Submission of Henry the Lion before Emperor Frederick I Barbarossa in the Peterskirche, Erfurt, in 1181 shows the inevitable outcome: Barbarossa had Henry tried in absentia, he declared that his imperial law had primacy over local German law, and Henry was stripped of his lands and made an outlaw. Henry’s allies abandoned him to his fate, and he was forced to submit to his uncle, as seen here. Artist not known, Emperor Friedrich Barbarossa concludes peace in Constance with the Lombards (date not known), media and dimensions not known, Rathaus, Konstanz, Germany. Image by Rainer Halama, via Wikimedia Commons. 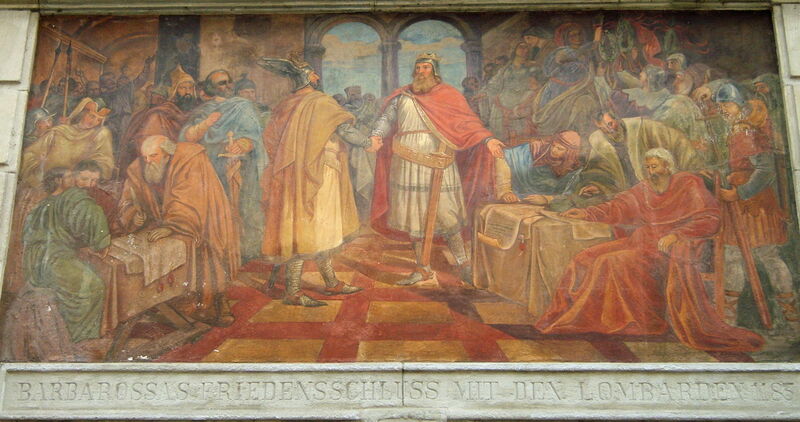 The Rathaus in Konstanz has a series of remarkable external murals showing key moments in history, including this undated painting of Emperor Friedrich Barbarossa concludes peace in Constance with the Lombards. Although the name Barbarossa appears in the inscription below, his beard does not appear to be in the slightest bit red, as he shakes hands to seal the peace with the leader of the Lombards. Spinello Aretino (1345–1410), The Entrance of the Pope Alexander III and Emperor Frederick Barbarossa into Rome (1407), fresco, dimensions not known, Palazzo Pubblico, Siena, Italy. Wikimedia Commons. In about 1407, Spinello Aretino painted frescos in Siena, Italy, showing some of the story of Barbarossa in that country. 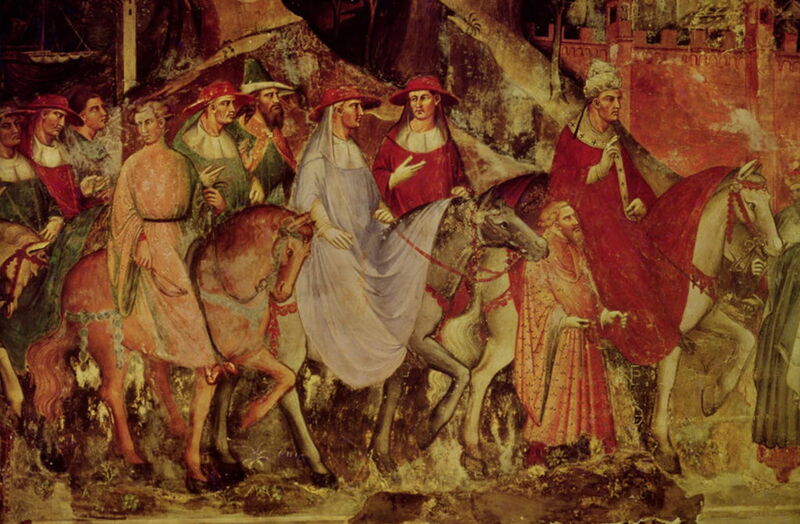 This section shows The Entrance of the Pope Alexander III and Emperor Frederick Barbarossa into Rome (1407), with the red-bearded emperor walking alongside the Pope’s horse at the right, and a clutch of cardinals behind. Spinello Aretino (1345–1410), Frederick Barbarossa submits to the authority of Pope Alexander III (date not known), fresco, dimensions not known, Palazzo Pubblico, Siena, Italy. Wikimedia Commons. Another section shows Frederick Barbarossa submits to the authority of Pope Alexander III, in which the ruler of the Holy Roman Empire, with the black imperial eagle on his back, kneels in front of the Pope. Together with French forces led by King Philip Augustus and English forces under King Richard the Lionheart, Barbarossa took an army of perhaps as many as a hundred thousand on the Third Crusade in 1189. However, on 10 June 1190, Barbarossa was thrown from his horse when wearing full armour. Falling into relatively shallow water of the Saleph River in Armenia, only about a metre (yard) deep, he was sufficiently shocked as to be unable to save himself, and drowned, at the age of of 67-68. Artist not known, Portrait bust of Emperor Frederick I, called Barbarossa (c 1160), media and dimensions not known, Catholic Parish Church of St John the Evangelist, Selm, Germany. Image by Montecappio, via Wikimedia Commons. 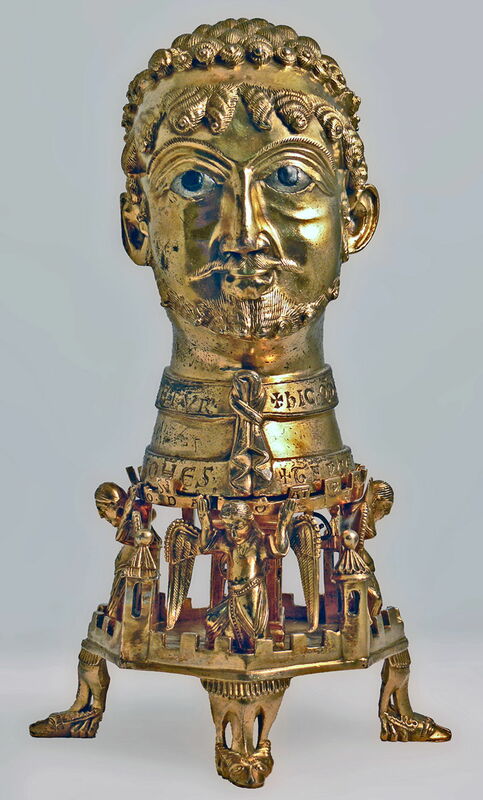 This startling gold-plated portrait reliquary bust of Emperor Frederick I was apparently made in 1160, and is now to be seen in the Catholic Parish Church of St John the Evangelist in Selm, Germany. Paintings of Barbarossa were either completed early, when his life was still relatively recent, or during the surge in Prussian nationalism in the late nineteenth century. Inevitably, he has been turned in legend into an Arthurian figure, ready to come to his country’s aid when needed. 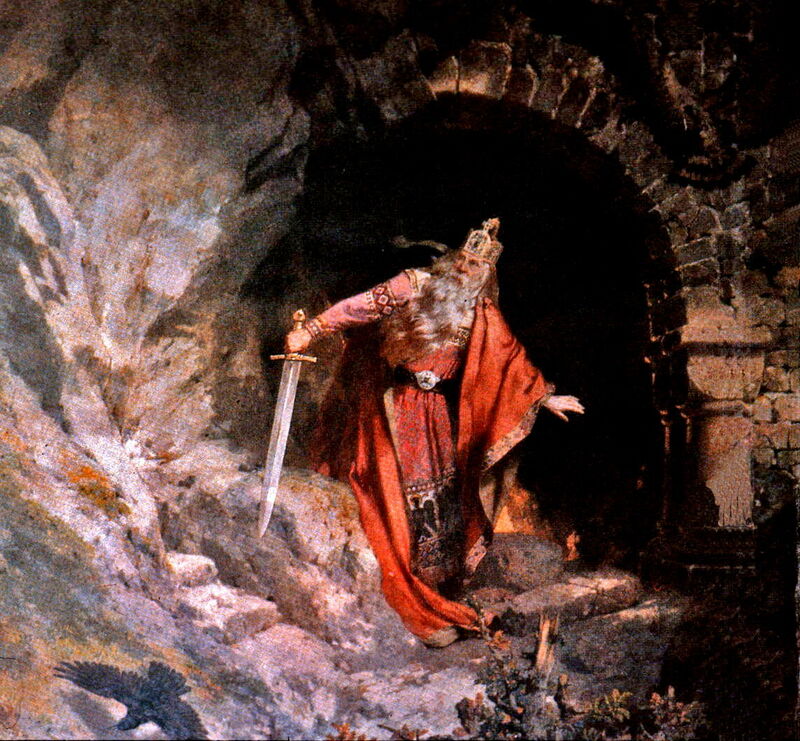 Hermann Wislicenus (1825-1899), Barbarossa’s Awakening (detail) (1880), mural, dimensions not known, Kaiserpfalz Goslar, Goslar, Germany. Wikimedia Commons. Hermann Wislicenus’ mural of Barbarossa’s Awakening of 1880 shows that romantic fantasy, an image which perhaps prompted Hitler’s generals to dub the invasion of Russia Operation Barbarossa. It demonstrates how a totalitarian state can subvert history – and his beard isn’t even red. Posted in General, Life, Painting and tagged Aretino, Barbarossa, beard, Cane, Foltz, Janssen, narrative, painting, Tiepolo, Wislicenus. Bookmark the permalink.